Completely custom made, this gorgeous modern kitchen has everything a bachelor could need. 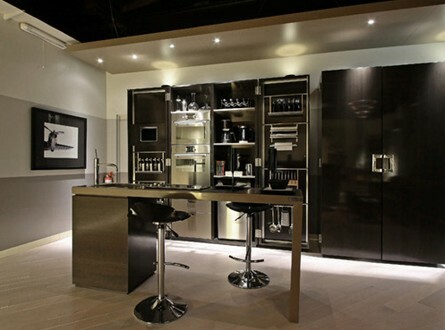 With black accents and attractive mood lighting, this kitchen is attractive, masculine, and very inviting. It’s also perfect for entertaining with lots of open space. 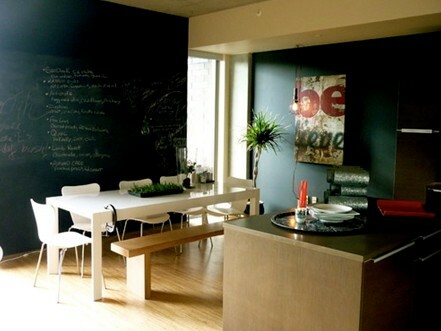 This kitchen is part of an amazing loft space overlooking the historic Seattle Space needle. A chic, hip, and comfortable space, this kitchen features great wood accents and a large chalkboard for notes, grocery lists, and even family chores. 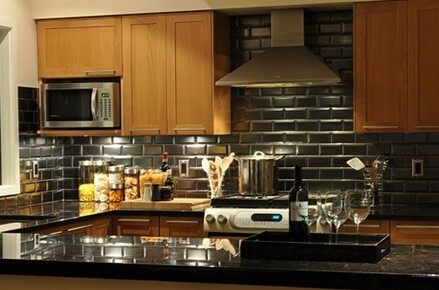 This gorgeous eclectic kitchen features a lovely balance of metallic tile and warm wood. The combination of traditional and modern finishes in this bachelor pad makes the space feel cozy and inviting while retaining modern appeal. The textured, faux wood surfaces and muted palette of this kitchen bring in a lovely combination of colors without being overwhelming or too intense. Stainless steel appliances are well complemented by the muted tones and the light upper cabinets make the most of the natural lighting. 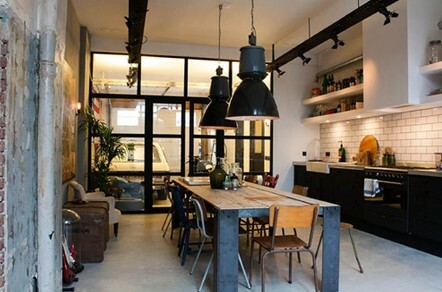 This modern, rustic kitchen not only had plenty of space, it also gets lots of natural light from the full glass wall. Painted brick and large pendant lights give the space a cozy, garage feel while the sleek white tile, black counters, and black oven balance it out and add a hint of posh.